It’s summertime in the northern hemisphere. Time to relax, enjoy the warm temperatures, and spend some time on vacation with friends and family. The XRP Community doesn’t seem to take breaks, though, and neither does crypto. While regular financial markets may open and close during normal business hours, blockchain technology is a 24 x 7 business, and never takes a break. Likewise, trading in this new class of digital assets never takes a break, either; the exchanges that comprise the worldwide crypto market are normally open at all hours of the day. This nonstop frenetic pace of activity may be unhealthy for people, but it’s how financial information and markets should be. When I send money overseas and across borders, the hours of operation in a particular country or for a particular member bank shouldn’t be a factor. Money should flow as easily as information, and as fast as any other packet of information you can send via the World Wide Web. Ripple gets it. SWIFT does not. While SWIFT has only made incremental progress on its horrendous multiple-day time frames for transferring value, it still isn’t able to meet basic expectations of customers that are accustomed to the immediacy of every other facet of technology and Internet applications. The future is clearly turning away from its prior correspondence banking approach and opting for something that is a sure bet for supercharging real-time transfer of value: Ripple technology built on an open architecture of standards-based tools and services. Relax and enjoy your summer; ILP-based technology and the XRP Ledger are running full time even as you relax on a beach somewhere! Why is that significant? That means that the creators of the exchange are seeking the creation of whole new asset classes and would like to take securities offerings and trade the stocks as easily as tokens on a blockchain. Like the United Kingdom-based Archax Exchange, the goal is to also build a platform that makes crypto more accessible to mainstream financial sector investors. It’s one more example of how the crypto market's reach is expanding, along with innovations in the creation of whole new asset classes based on blockchain technology. I suspect the SIX exchange will serve as an example of how other exchanges could approach integration of blockchain technology and tokenization of securities. Thailand is one of many countries that is vying to be a global center for the blockchain and budding cryptocurrency market. To support this goal, the country recently wrote an entirely new law defining rules for both cryptocurrencies and tokens, including common-sense definitions of both. The reason given for inclusion on the list was because of existing liquidity with the Thai Baht, Thailand’s national currency. Prior to this point, some of the general crypto news about India's stance on cryptocurrency had prompted me to be concerned about Ripple’s strategy for entering the large Indian market. After hearing comments about Ripple’s India bank strategy in this video, I’m not only unconcerned, but even bullish on Ripple’s extension of RippleNet’s reach into the subcontinent. Cambridge Global is one of the large companies that is conducting a trial of xRapid. On March 1st, Ripple announced the customer win on their Insights page, 9 and no wonder; Cambridge Global is one of the largest corporate payment processors in the global oil and gas industry, among other markets. 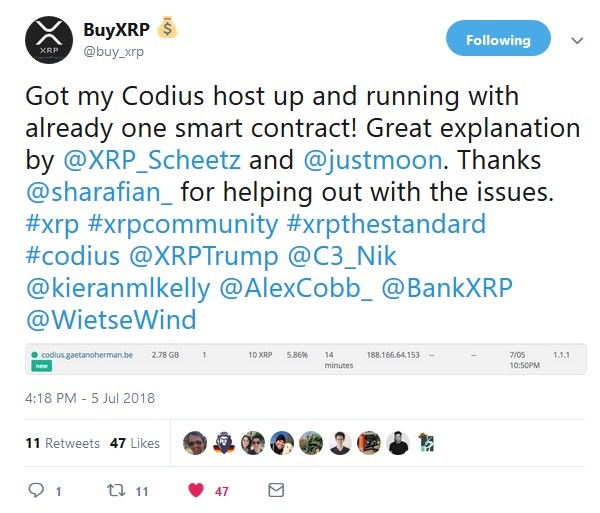 While they were not among the group of four companies that announced confirmation of XRP’s cost savings, they also were continuing to test xRapid. Of course, this last statement sparked much speculation that he may perhaps be talking about the production implementation of xRapid, although he did not reveal his cards during the video. We wouldn’t expect a corporate video to reveal too much, right? They do have competitors, and Ripple technology is helping them compete! The video also featured Jim Chauncey-Kelly, Ripple’s Director of Talent Acquisition, describing an open position that needs to be filled for a Program Manager for Ripple’s University Blockchain Research Initiative (UBRI). "Do you actually know what happens when you send a text message and throw some emojis onto it?" He then drew a parallel with payments, and pointed out that consumers probably don’t ultimately care what is ‘behind’ their real-time payments, only that it works. It was definitely food for thought, and probably is spot-on when it comes to whether or not consumers should really understand the underpinnings of blockchain tech. It was a polite nod to the Coil team – including its new Chief Technology Officer and Coil Co-Founder Ben Sharafian – for helping out a Coil community developer. It’s great to see how the positive culture from Ripple is now spilling over into a new company with some of the Ripple ex-pat founders. 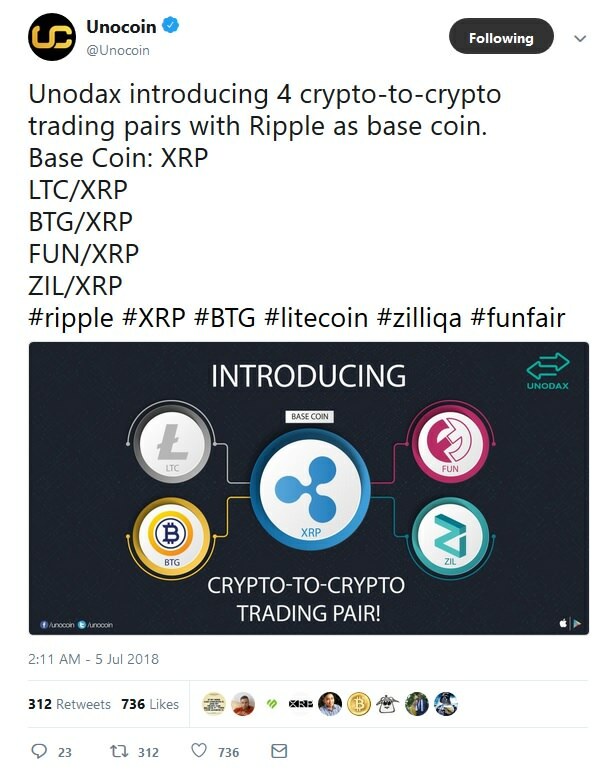 Note that the tweet is announcing new pairings; the exchange already supported XRP trading against Bitcoin and Ethereum previously. B2BX is an exchange that approaches trading in a way that most exchanges do not; they aggregate the liquidity from an assortment of other exchanges, and attempt to thereby access a larger market for trading. They seemed to know in advance the next questions that people would be asking, and answered them in advance with this tweet; I’m referring to their statement about supporting withdrawals to private XRP wallets. 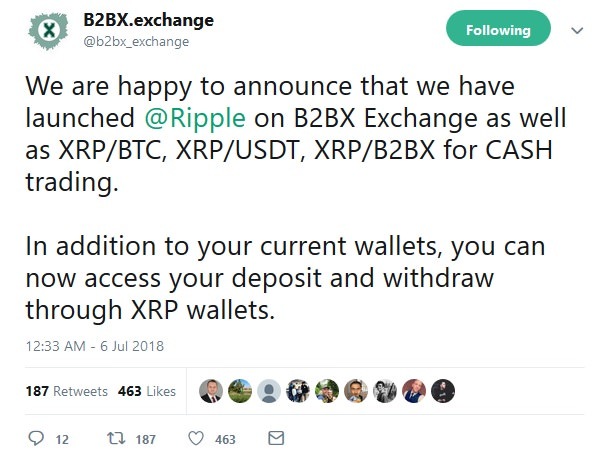 If B2BX has reasonable fee structures, I can see them picking up a number of customers that like to trade in XRP, especially if they can make good on their claim to combine liquidity from different exchanges. If you’ve been following my blog, you know that I don’t stray too far from hard facts and news items regarding XRP or its various ecosystem components. No matter the topic, I dive in and analyze it from multiple angles, trying to determine how each new factoid fits into an updated SWOT analysis. However, there is another component to cryptocurrency that is often overlooked: The importance of using imagination. When I first started following crypto back in 2013, there was very little in the way of actual end-user applications, convenient front-end wallets, or anything resembling user-friendliness on crypto trade platforms. The early investigator of cryptocurrency was required to visualize what the future might look like given the latest advancements. While that’s all starting to change after five long years, there still is much progress to be made to help crypto – and XRP – gain mainstream acceptance. Part of that is to help people understand just what digital assets could do to supercharge the economy or settle cross-border payments in real-time. One XRP Community member, @XRPeteSampras (XRPChat handle), decided to do something about it. Using storytelling to help potential XRP investors or users to understand its potential and its use cases is an incredible idea, and I predict that the contest will attract some of the best writing talent in crypto, as well as bring in some readers that may otherwise not actively seek out crypto-related topics. 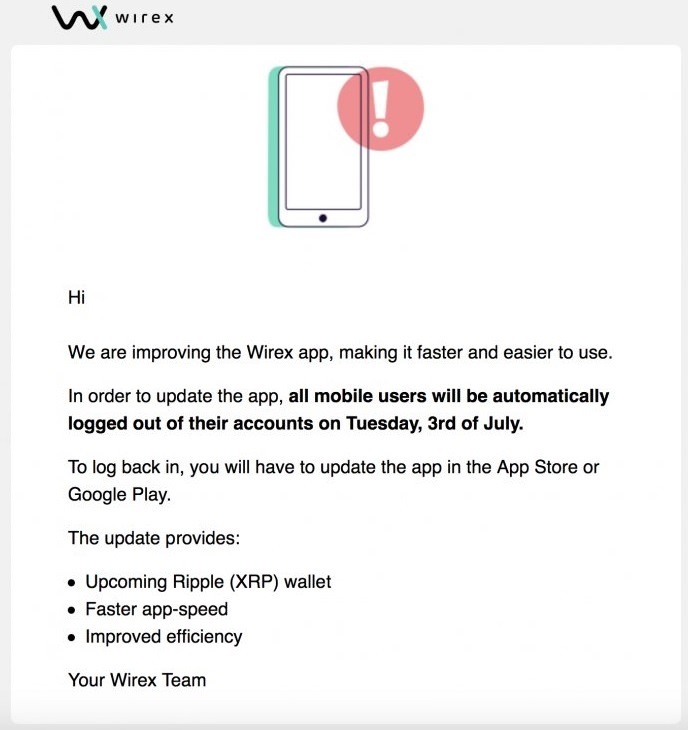 As the message indicates, the update happened on July 3rd, so Wirex users should already have access to XRP support and a wallet. Wirex is the latest example of how crypto market stakeholder organizations and businesses are moving to quickly add support for XRP as 2018 unfolds. "The demo application simply prepares an unsigned transaction and sends it to the Ledger hardware wallet for signing. All transaction details are securely displayed and the signing process only begins after a physical button press. The signed transaction is then returned to the demo application, where it is submitted to the XRP ledger via Ripple's public rippled server (wss://s2.ripple.com)." 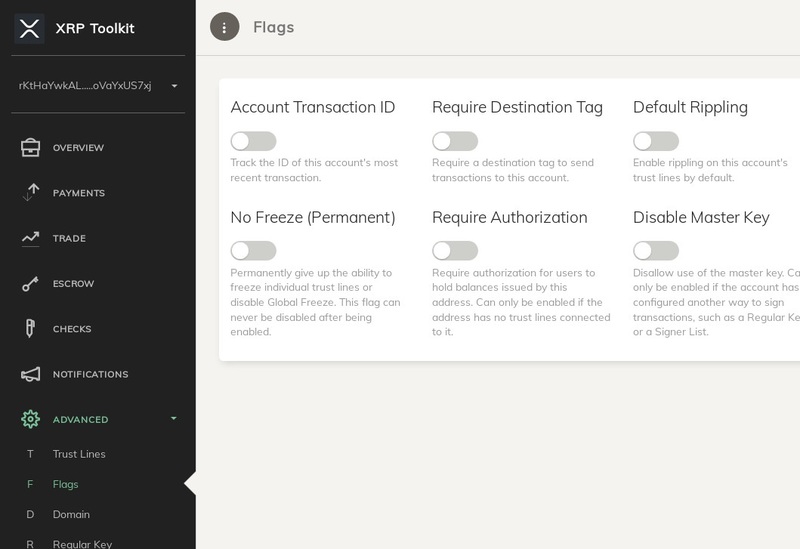 RareData indicated that this is a demo application released to the community, in advance of his coming XRP Toolkit (Q3, 2018), where Ledger wallets will be one out of many login options. For those familiar with MyEtherWallet for Ethereum, imagine a security hardened MyEtherWallet for XRP. It’s great to see so many new applications springing up that truly reflect a small-but-growing cadre of community developers who are potentially ready to boost XRP adoption with new applications and tools. If you choose the "Watch on YouTube.com" option for the video, you'll see that there is a comprehensive listing of resources and links that he used to complete the task. Overall he’s created a fantastic addition to the library of reference material for those developers that want to start learning Codius smart contracts. Unlike the SWIFT Correspondence banking network, RippleNet doesn’t concern itself with bankers’ hours. It’s apparent that SWIFT is not enjoying having to compete with Ripple, and no wonder; the odds are now starting to clearly swing in the Silicon Valley company’s favor. They’ve signed up over 100 banks, among them the second largest private bank in India. 19 Each week we hear of new banks that have joined the league of financial institutions that are implementing Ripple’s solutions for making real-time payments across borders. While summertime in the northern climates is typically a relaxing season, there is no stopping progress; the technology underpinning banks using RippleNet is running 24 x 7, and can scale to easily support global levels of transactions. Remittance processors like Cambridge Global are using this new technology to provide a competitive advantage against their foes, and now you’ve heard it yourself; they are slowly but surely turning away from the Archaic SWIFT system for transferring value. Cambridge Global is piloting xRapid for sourcing liquidity, along with a host of other remittance processors. Doubters in the crypto market - or in banking - can bury their head in the warm summer sand only so long; even the naysayers will eventually acknowledge the direction that the future is taking. That time is drawing near, and as a fellow XRP owner my advice is to use the summer months to recharge your batteries if needed, and enjoy the weather; I’m confident in the future and I’m even more confident in the multiple companies, community developers, and other stakeholders who are building applications powered by XRP.